Today was the last day of school. For kids, that meant going to classes, getting and signing their yearbooks, receiving awards, cleaning out lockers. For teachers, that meant entertaining students, presenting said awards, signing yearbooks. (I have to admit, signing yearbooks as a teacher makes me feel like a celebrity, but I think that’s mostly because we have little time to spend writing, so it’s like a constant stream of students approaching with a book and pen in hand, requesting an autograph.) For me it meant good-bye. 2.5 hours after The Final Countdown played over our PA system to celebrate the end of the school year, I was done. I had cleaned my room, boxed my stuff. Many students left me lovely and thoughtful notes in my yearbook and on my white boards. A few gave me nice gifts, as well: a travel photo album, a copy of Maphead by Ken Jennings, and a generous gift to Barnes & Noble, to name a few. But what I was really leaving with as I walked out of that building was a stomach full of butterflies. Half of the butterflies were flitting around, anticipating the incredible journey that was about to begin; the other half felt like stone in my belly, weighing me down with the anxieties that could have kept me there for next year, and the year after that, and the year after that. Driving out of that parking lot provoked another What have I done!? moment, truth be told. But I knew, too, that what my coworkers had said was true, and will continue to be: Don’t be sad! You’re moving forward! I had the privilege to work with some of the most caring and dedicated teachers on the planet, and to teach some of the most thoughtful and motivated students. If any of you are reading this, thanks. For teaching me about how to be a better person, a better teacher and a host of other valuable lessons. I will miss you. Bottom left: My monkey hall pass who went by various names. He was “relaxing,” according to the student who set him up. 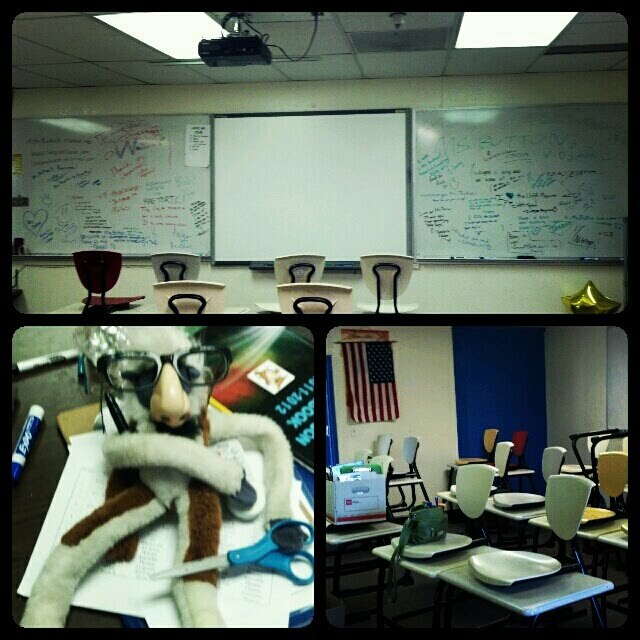 Bottom right: My cleaned and empty classroom with my box of personal belongings waiting sadly to be taken to my car.